Hello, how are you all ? I'm SO excited it's finally spring here in Australia !!! Lately I have been baking and cooking up a storm of gluten free vegan deliciousness and thought I would begin to share some of my favourite recipes with you all. For those of you who were wondering, yes I am vegan and also gluten free, so all my recipes will be too. 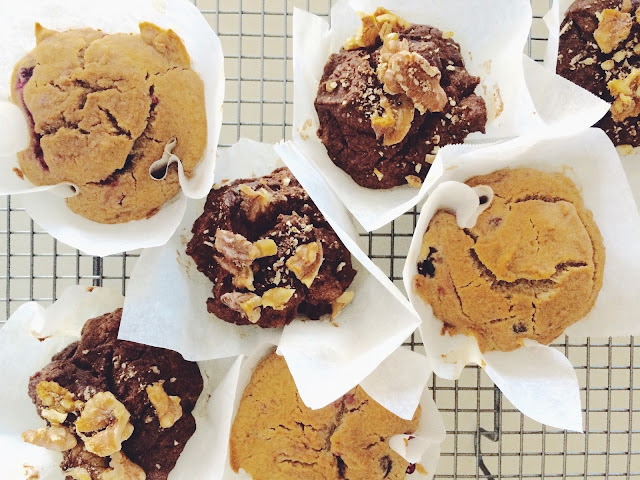 Todays post will be a recipe for my absolute FAVOURITE muffins that are just SO yum. These muffins egg free, dairy free, gluten free, refined sugar free and oil free, but are still super moist and relish. This recipe makes about 8 meduim-large muffins. Enjoy x. TIP: Because there is no oil in these muffins, be sure to use parchment paper or non-stick paper cupcake holders. If like me, you don't have any, you can make your own by cutting up squares of non-stick baking paper and placing it over each muffin "cup" and dolloping the mixture on top. If you choose this DIY method, be sure to let the mixture sink to the bottom of the "cup" so you can fit more mixture in each muffin paper to make BIGGER and YUMMIER muffins ! 2. In a large bowl, mix all the dry ingredients together. 3. Add all the wet ingredients into this dry mixture and combine until the mixture is smooth. 4. If you're adding extra ingredients for different flavours, add them now and stir once again. 5. Using a large spoon, fill each cupcake holder in the muffin tray. 6. Put in the oven and leave to bake for 25-30mins. Test by sticking a toothpick into the middle of one, and if it comes out clean, its ready ! 7. Remove from the oven when ready and transfer to a wire cooling rack. TIP: Eat them warm from the oven ! Ohhhhh yuuum soooo goooooood. These gluten free vegan muffins are so so fun and easy to make, I hope you enjoyed them as much as I enjoyed eating them ! Please let me know or send me a photo if you do make these and be sure to let me know how they turned out.